Marketing is the key to any business. No customers means no income, and as a Realtor the way you market yourself and your business is key to your longevity in the industry. Some agents choose to join teams and take a larger split in exchange for marketing being done for them, but some like to take it upon themselves to drive their business. If you’re one of these individuals you’re probably aware that the internet has changed the game. You should be focused on farming the most popular platforms for new business. Social media, in the year 2018, has grown into a tool the average person utilizes every single day. Advertising on social media gives agents access to market to various niches – whether you’re wanting to target individuals based on location, income, hobbies, professions, etc. With the right strategy you can be driving your target market to your search site in no time! To get started with Facebook ads you’ll need to have a Facebook business page setup prior to building a campaign. We won’t get into the setup of this in this blog post, but if you’re looking for information on how to do so you can read this post. Facebook as a marketing tool, is one of the most impressive tools in history. The social media platform itself has over 1 billion active users and owns Instagram, which has over 100 million users each month. Both platforms are connected as far as marketing and setting up ads within their platform allows you to market to individuals on both Facebook and Instagram. With so many users offering up personal data to their social media profiles every single day, Facebook is a treasure trove of data and information about users and their habits and Facebook Ads does an excellent job of segmenting this data and providing actionable insights and targeting options for whatever you need. To get started building your audiences, you’ll want to head into the ads platform and head to the ‘audiences’ page. Once you’re there you’ll see a blue button that allows you to create an audience. Click this and select the option to create a ‘saved audience’. This will allow you to use Facebook’s entire catalog of targeting options for your audience. Imagine you are an agent in Los Angeles, California who wants to target and farm for new clientele. The following screen shot shows how you might go about setting up this campaign’s audience. The first thing you’ll want to do is give your audience a descriptive name. The reason being that once you begin using the platform more and experimenting with different audiences the number of custom audiences you own will grow and if you weren’t organized from the beginning you might end up with bunch of niche audiences with generic names. Step two would be to choose your desired target location. You’ll see from our image that I’m targeting Los Angeles, California. You’ll notice on the map below that It gives you a radius of targeting which is controlled by the distance to the right of ‘Los Angeles’. You can edit this to make your radius bigger or smaller for more direct targeting. If you have specific zip codes you’d like to target you can use them here. Instead of Los Angeles, we might use 90210 and Facebook will recognize this as a location. Your third step in setting up your custom audience is to choose between age, gender and language. This is all dependent on who your desired demographic is. For agents who might be bilingual targeting specific languages can help you target individuals who speak a specific dialect and help your campaign be even more targeted! Once you’ve set up this base structure for your audience you’ll move on to more specific targeting options for your audience. The image below shows you Facebook’s ‘detailed targeting’ field. This is where you’ll begin to experiment the most with your audience. Facebook offers three base categories for targeting: Demographics, Interests and Behaviors. 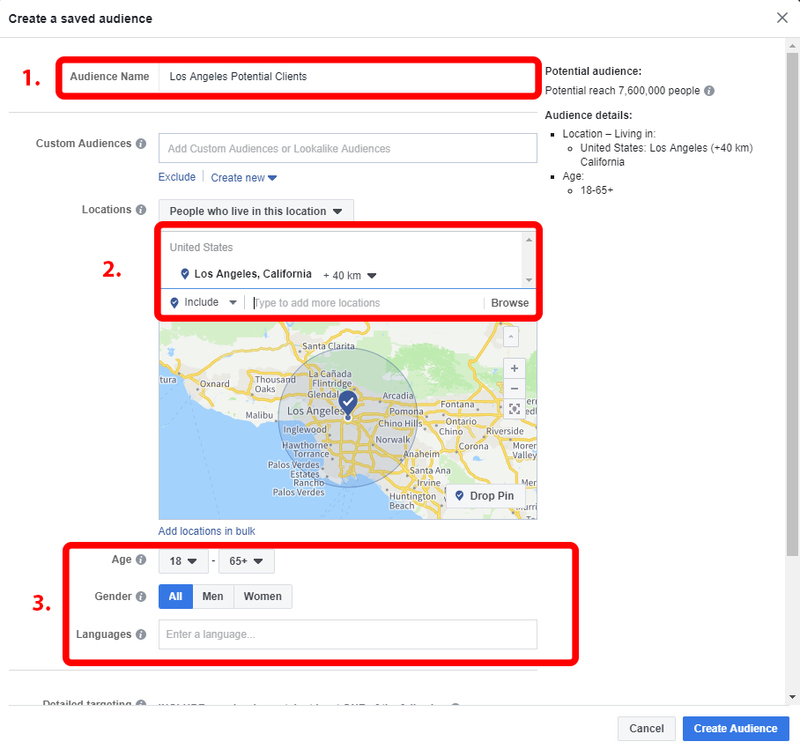 Each of these categories give you different targeting options to choose from that will start to more accurately target individuals that are within the demographic you are looking to market to. So let’s say we wanted to target individuals in Los Angeles who are engaged to their partner and may be looking for a new home to begin their life together. Facebook makes this easy! This is possible because individuals will update their relationship status with Facebook and then we can use this data to market to them. 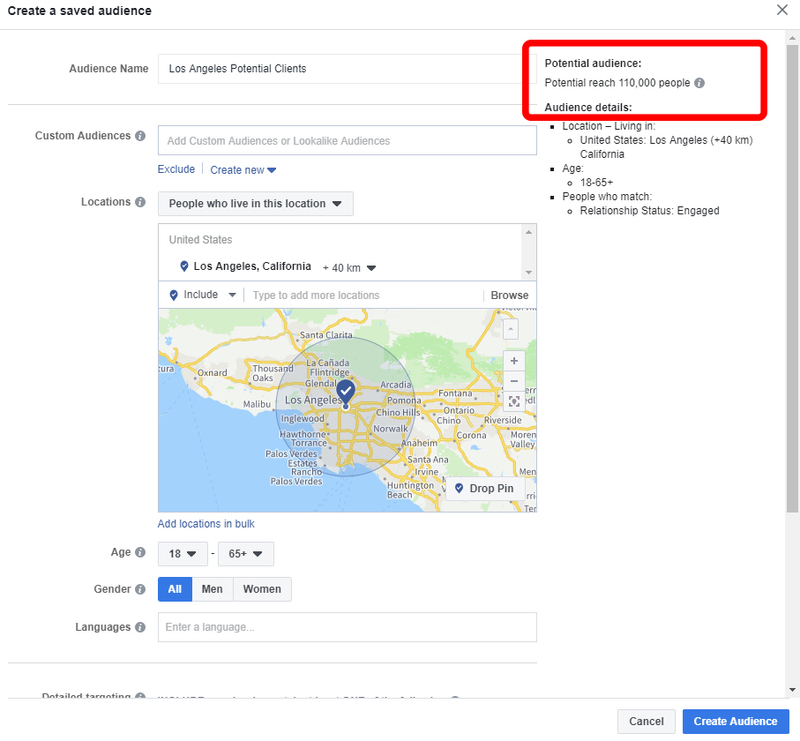 A great thing about setting up these audiences is that as you begin to narrow down your targeting, Facebook will keep you updated on the size of the demographic you’ve chosen. Below you’ll see Facebook is letting us know that there are approx. 110,000 individuals with the relationship status ‘engaged’ within the 40 km of Los Angeles. Pretty detailed! 110,000 is still a lot of people to run campaigns to and that mix of individuals might not meet the exact criteria we are looking to target so we’ll narrow our audience even further than what we have now. Let’s say we’d like to target the wealthiest individuals in Los Angeles who are currently engaged. Facebook allows us to do this as well! First you’ll want to make sure you ‘narrow’ your audience – don’t exclude – but this feature is useful as well in the right circumstances! 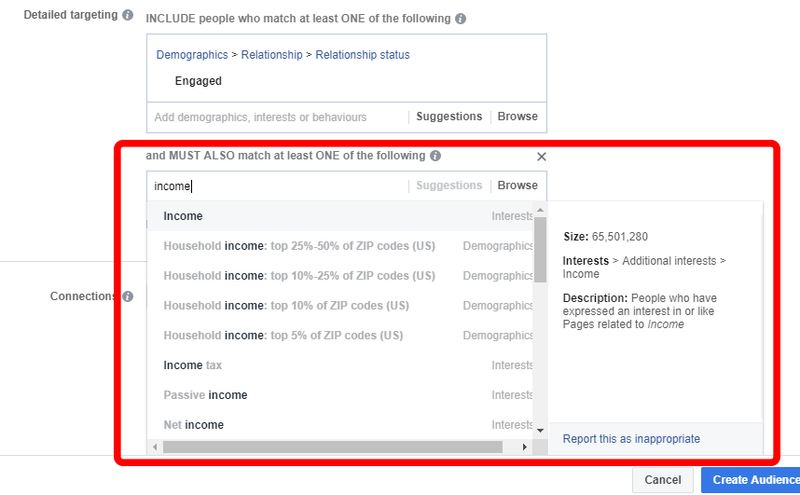 You’ll see below that Facebook gives us the ability to target individuals by their income stats. After searching ‘income’ in the search bar you’ll see it yields some results involving income. For more high-end clientele you’d want to target the top 5% here. Let’s choose this option and see how big our desired target market is now on Facebook’s platform. From 110,000 people to just 6,100 you can see how narrowing our audience dropped our potential ads reach but also made it more targeted towards the type of individual we desire in our real estate business. From here we’d be able to utilize this audience we’ve built here to run targeted advertisements on Facebook or Instagram. 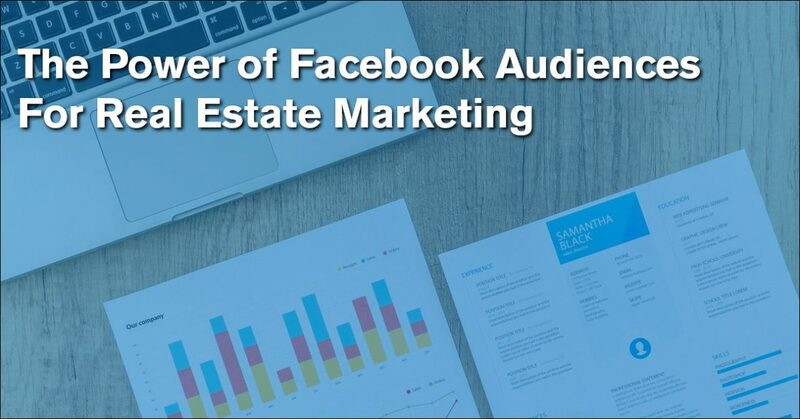 You should now see how powerful of a marketing tool Facebook can be for Realtors, or really any industry. With Facebook, your marketing campaigns can be as broad or niche as you’d like – the power is in your hands! Continue experimenting with this tool to build audiences that may be important to your business and it’s success. This platform is completely free to use and only requires a Facebook business page – which you should have as a professional agent anyway! Marketing is all about experimenting and finding what works so don’t be afraid to test different strategies for your business. As technology grows more and more as a part of our daily lives be sure you’re in the position to use it to your advantage for your real estate business!